We’ve all seen the big motor homes pulling cars and jeeps… and we’ve seen them with motorcycles mounted on heavy racks on the back. The point of this is to have a vehicle for local travel once you’re set up at the RV space. I’ve always felt the towed cars to be excessive and my first thought is often “just get a bicycle”. But I get it: You’re driving an entire home, so once that’s parked, you need something to get around in. One thing I love about Vanlife is the dedication to minimalism and simplicity, and nothing is simpler for basic, local transportation than bicycles. And they’re so much fun to ride! That’s reason enough to pack them along on any trip. Whether you’re bringing your high-end mountain or road bike, a stack of bikes for mom, dad and the kids, or just tossing an old cruiser on for running around the campground or exploring a new town, the right rack is a crucial additions to your van setup. There’s a lot to consider when choosing a bicycle rack. This article will help you navigate the seemingly endless world of rack options. How many bicycles do you need to carry? 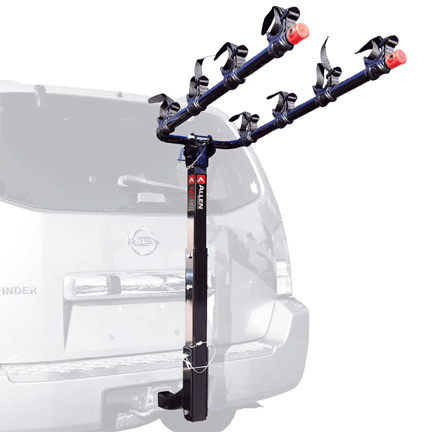 Due to the weight issue, this will be the primary factor in choosing a bike rack for your van. How important are your rear doors? If you need to access your rear doors frequently (like at rest stops), this is a crucial consideration. What’s your budget? While I don’t recommend going with an ultra-cheap rack (more on this later), you can find some decent options that won’t break the bank. What’s your bike worth? Many serious cyclists have very valuable bikes and nothing attracts a thief like a high-end bike. Unless you want to be constantly fearful of getting your bikes stolen, don’t scrimp on bike rack security. 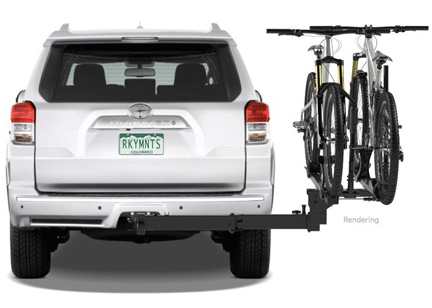 Roof bike racks are intended to affix to a rooftop rack and carry your bicycles on the top of your van. Rooftop rack mounted bicycle racks connect and brace your bicycle by a few techniques. Fork mounts hold your bicycle by the front fork, but require front wheel removal. Upright bicycle racks hold your bicycle by the front tire or down tube. On all roof racks, rear wheels sit in a tray and are held down with ratchet straps. Warning: Not a good idea to go with low quality, poorly rated roof top bike racks. Wind and lateral force from turning mean these racks need to be very solid and very well designed to keep bikes safe. The advantage of roof racks is that they get the bikes totally out of the way. They’re not hanging off the back and they’re not in the van. It can be a struggle to get the bikes on top of a van. If muscling bicycles on and off your van sounds like a bummer, you might move on to a rear oriented rack. If you have a higher roofed van, or you’re uh… vertically challenged, consider carrying a small folding stool for reaching bikes up high. Low overhead at drive through’s, parking garages, eves, awnings… can be a very bad thing if you forget the bikes are up there. Plan to keep a post-it note (or other mnemonic device) on the steering wheel to help remember that your van is about 4 feet higher with bikes on top. Fork mounts can void some bicycle manufacturers warranties. Best to check with your bike maker about this. 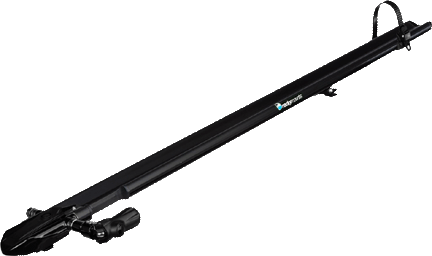 Trailer hitch receiver mounted racks come in a variety of prices, styles, weight limits and features. 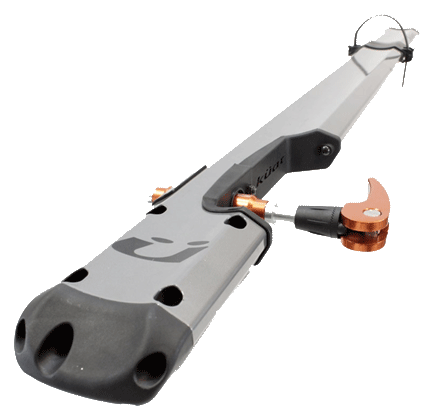 They mount into a 2 inch or 1-1/4 inch trailer hitch receiver and can hold many bicycles, if needed. A trailer hitch receiver is required. Components like fold down arms, tilting poles, swing-away bases, hitch locks, locking cables and bicycle stabilizers come on the various models. If getting in and out of the back of your van a lot is part of your travel routine, you’ll need a swing-away or tilt-out bike rack for your campervan. One concern with this type of rack is that the cheaper models tend to rattle and sway around a bit. Best to not choose the cheap model if you need this feature. If you don’t need much rear door access, the simple hitch mounted rack is my favorite because it’s uncomplicated, locks up easily and holds a lot of weight. Keep in mind that your overall vehicle length will be increased. It will take some practice to get used to backing, parking… Where I live this can mean over-length charges on ferry rides. While rear door mounted spare tires are less common on vans than suv’s, they do exist, and if you’ve already got a tire on your door, you might as well add some bicycles. 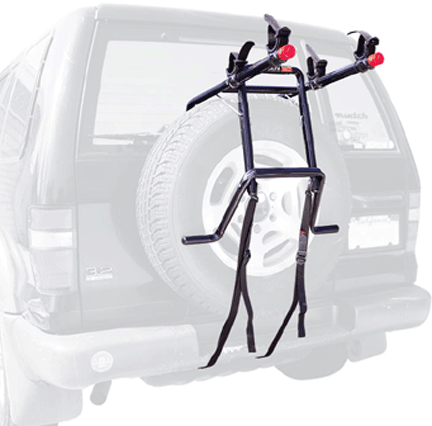 Spare tire bike racks tend to be tough, simple to use, lockable, and give easy access to bikes. Note the strongest option. Depending on the weight limits of your tire mount, it’s best to keep number of bikes to two, maybe a kids bike, too. Easy to install and lock. Simplicity is probably the biggest advantage with these racks. No hitch mount required, this can be the cheapest option. Need to be removed if you get a flat, so make sure you’ve got the right tools on board to remove the rack. Also add length to van. Many racks come with locking systems, but for some, “that’s where they get ya” on price. 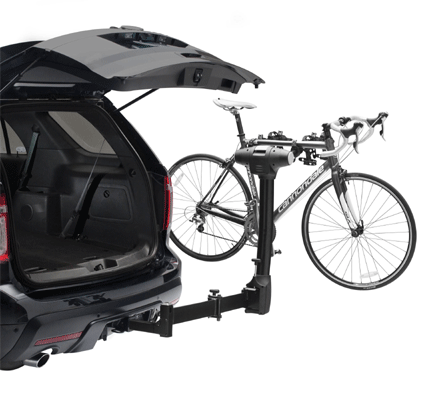 A roof rack will allow you to use high quality cable and U-locks for bicycles to keep bikes safe. Hitch mounted racks need locks for the hitch, rack and bicycles, and they’re the easiest for thieves to reach, so get the good locks. Spare tire mounts are pretty solid and easy to lock bikes to with cable and U-locks. How much is the trailer hitch on your van rated for? How about your spare tire mount? And, again, the roof rack you want to mount your bike rack on will have a weight limit. 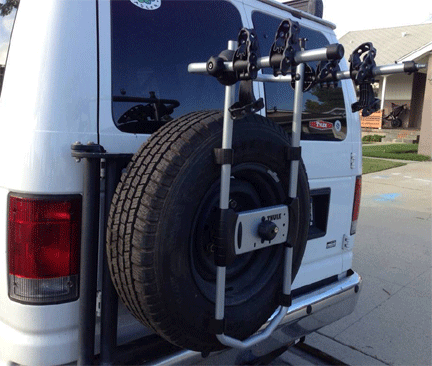 Carefully research your vehicle weight limits before buying a rack for your van. There’s lots of info on forums and manufacturers sites to find these answers. Bicycle’s are the tow-along vehicle of Van Life! First, know the number of bikes you’ll be carrying. Are you in and out of your rear doors a lot? Expensive bikes? Don’t scrimp on rack quality. Roof mounted racks get bikes out of the way, but don’t forget about that extra height! Trailer hitch mounting (especially with swing-away) is the most convenient, solid and secure. Spare tire racks are simple and tend to be lower cost, but hold less bikes. Easy to steal bikes represent money to people in need. Lock ’em up! Take no chances. 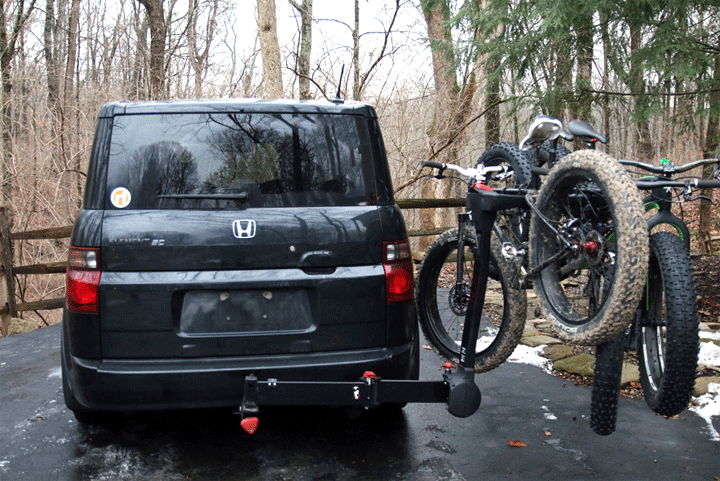 Get to know your vehicle, hitch and spare tire weight limits before committing to a bike rack for your campervan. While the big brands like Thule and Yakima are always great options if you’ve already got their cross bars, some other nice options are available as well. Please read reviews carefully and keep important details in mind such as the type of cross bars you have, or plan to buy. 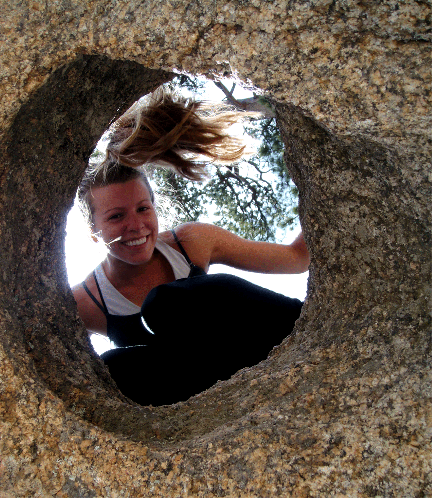 A campervan essentials list for maximum fun in a minimal space!